Most of us seismologists think we know it all. Just look at this year's large earthquakes: Within a few hours after the devastating Haiti Earthquake in January, the fault on which it occurred was identified (see blog January 13, 2010); after the giant temblor in Chile in late February, it took only minutes to issue a tsunami warning (see blog March 1, 2010); and within 24 hours, scientists found ruptures in the Earth's surface caused by the strong quake which shook northern Baja California and the southern part of our state on April 4th (see blog April 9, 2010). This blog is full of entries describing all the things we know about earthquakes - but here is a real puzzler from Europe, which nobody has been able to explain so far. Last Sunday night, shortly after midnight, the Earth rumbled under the Alhambra, the old Moorish citadel overlooking the ancient Spanish town of Granada. Seismic sensors all over Europe reacted to this 6.3 magnitude quake, but few people felt it and no damage was reported from anywhere. 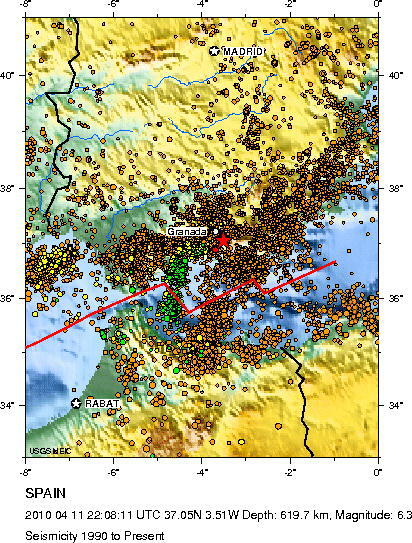 The computer programs in the data centers of the European seismic networks and at USGS's Earthquake Information Center in Golden, Colorado, quickly and automatically calculated the exact location of the quake: Its hypocenter lay just 8 miles southeast of Granada's city center - but at a depth of almost 400 miles. This map shows all earthquakes east of the Strait of Gibraltar, which have been recorded in the last 20 years. Their colors depict the depth of the hypocenters. The depest temblors recorded before Sunday's quake (red star) was the green cluster with depths not exceeding 100 miles. When seismologists got to their offices on Monday morning, they scratched their heads: "400 miles? Something must be wrong!" The deepest quakes in Europe occur under the Tyrrhenian Sea just north of the Italian island of Sicily. There, the African plate subducts under the European plate, similar to the movement of the Gorda plate beneath North America north of California's Cape Mendocino. But even in Italy, the quakes' foci do not reach deeper than 300 miles. In addition, there is no known subduction zone within 1000 miles of Granada - and all deep earthquakes known to researchers occur within the confines of these zones. Hence the question arose: Did some measurement go awry which led to locating the Granada quake wrongly to such super depth?